Boris the bear is everything a bear should be – big, strong and very, very helpful. When his school class goes off for a camping trip in the forest, Boris’s strong arms means he can carry the pack with all the camping gear. When the mice get tired, he carries them, too. And when they put up the tent, Boris is just the right height to help out. Boris doesn’t always get things right but all turns out well when Boris inadvertently helps out one more time, saving the campers from two very naughty wolf cubs. Bravo Boris! This is a great picture book story for little (and big) helpers everywhere. Like fantasies? Like Westerns? Then you’ll love this! 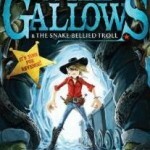 Will Gallows and the Snake-Bellied Troll brings you the best of both worlds – elves, dwarves and flying horses come face to face with ogres, trolls and gold – lots of it! Will Gallows, who is half human and half elf, wants justice for his father’s death at the hands of a rather nasty snake-bellied troll called Noose Wormworx. He’s determined to bring the troll to book and sets off to find him in the mines of Deadrock. There, he uncovers a plot to mine gold that could destroy the whole town. Will is helped in his quest by a feisty dwarf, Jez, a handful of ghosts and a whole host of flying horses in the shape of the sky cavalry. How could he possibly lose….? This is an exciting adventure full of great drawings, ideal for young cowboy wannabes aged 8 and over.